The King’s Club is a children’s club for ages 3-11 years which meets on Saturday mornings, 10.15 a.m. – 12.00 noon. 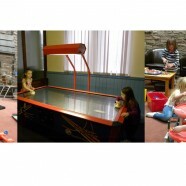 Activities include: games, bouncy castle, PS3 & Xbox, air hockey, table football, singing and Bible stories. £1.00 admission plus 30p for sweets and a drink. Everyone welcome.